Bring a large pot of lightly salted water to a boil. Add spaghetti and cook until tender, about 7 minutes. Drain. Meanwhile, heat 2 tablespoons butter in a large skillet over medium-high heat. Add minced garlic, onions and mushrooms; cook until tender and caramelized. In the same pan, add the white wine and chicken broth, scraping bits off the bottom of the pan. Stir in the cream cheese, breaking it up with a spoon as it melts and add cream. Stir in the parsley, basil, Parmesan, the remaining butter and raw shrimp. Simmer for 5-7 minutes until slightly thickened and shrimp cooks until pink. 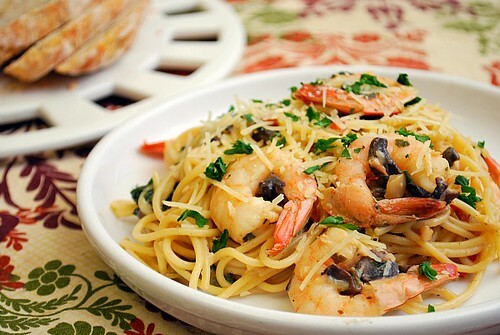 Toss in spaghetti into the pan to combine with shrimp and sauce. Serve hot with extra Parmesan cheese and minced parsley for garnish. What a gorgeous plate of pasta! I made this the other night and it was great! I used whole milk instead of the heavy cream and shallots instead of onions. Sauce was a little too liquidy so I added some cornstarch to thicken it.